The trust is small, but it is enough to lift the small triangle construction. On the other hand this type of ‘motor’ can produce a great impulse, meaning a vehicle using this kind of propulsion can achieve great speeds. This video is what my camera recorded, with no afterward processing. The hissing sound is caused by the High voltage. 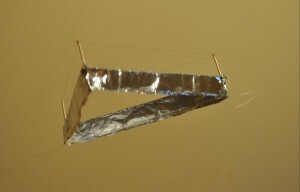 The pieces of paper are to demonstrate the vertical flow of air and ions produced by the motor. When the setup is hovering above, you will see them move. The power supply (and the energy requirements) are too big for the trust this setup can produce. So because of this, I cannot build an autonomous device, and the supply must be external. There are two thin wires going from the 50kv supply to the Ion Thruster. The movement is erratic, a flying object using this technology would need to use additional stabilizers to follow a given trajectory. For this demo I used two thin thread anchors and the supply thin wires. Even so, the movement is unpredictable, but it proves the Ion Thruster works. According to Sub-Quantum Kinetics, this is most likely an Electro-Gravitic Propulsion device, not a “ionic” propulsion device, as “civilian” Relativist physicist (unlike military R&D physicists) would prefer to call it. I would suggest a good read: “Secrets of Antigravity Propulsion” by Paul A. LaViolette, Ph.D. I would really appreciate your plans to build this device for myself, although I think I have a good idea how to do it. Thanks for your message, however in my opinion there are ions that give this device thrust. I do not believe Electro-Gravitic propulsion devices are currently possible. Regarding your question, I do not have any other recorded information, besides what’s presented on this page. 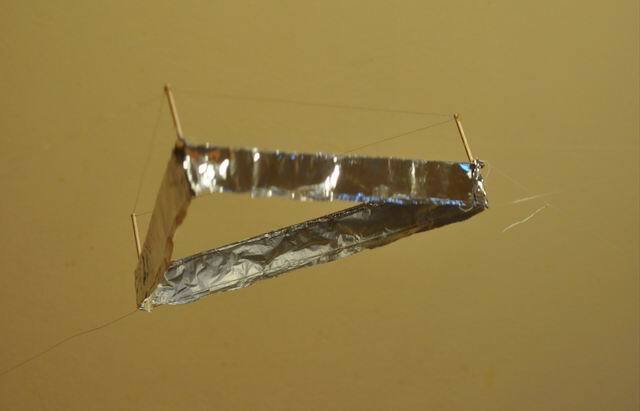 I should underline that the construction itself should be very light-weighted and the bottom electrode (aluminum foil) should be as big as possible (in terms of surface). Try an HID power supply an the air gap between foil and thin wire should be 1 cm per thousand volts. Will, can you elaborate on that?